The Internet is not exactly short on "How to Potty-Train Your Kid in 3 Days" articles, but is it really that easy? Well, that really depends on a lot of things. Everything from your child's personality and interest level and even your own patience and understanding can all play a role in the success of this accelerated method. Here, we'll discuss the ins and outs of this fast-tracked potty training method. We'll examine all that you need to know to prepare and succeed and you should expect along the way. Let's begin! Day one of the program starts by removing the diaper from the child and allowing him or her to run around the house naked. According to an article from Baby Center, you and your partner should take turns monitoring the baby for signs of needing to use the restroom. As soon as the baby begins to go, immediately take them to the bathroom. Even if only a few drops makes it in the toilet, you should do a happy dance that you created for the occasion. You all should make sure to drink a ton of water so that you need to use the bathroom often. Each time you use the restroom yourself, you should bring the child along so they can learn by example. Once the baby has been able to successfully pee or poop in the potty chair about a dozen times, they will begin to make the connection. Before bath or nap time you should ask your child if they need to use the potty. You should still use diapers during sleeping. An article from Baby Center indicates that day two is much like day one, but with one critical exception. On this day, you should make time for one hour of outside play. Make sure to go outside after you child has used the potty chair. This will train them to always use the bathroom before leaving the house. This can greatly reduce the likeliness of accidents in the future. On day three you should plan for an hour outing in the morning and another hour out in the evening. Again, ask your child to use the potty before leaving. Remember to pack extra clothes and the potty chair, just in case. Believe it or not, there are a number of factors to consider when it comes to potty training. Here are a few of the most important things to think about throughout the process. According to North Carolina Health News, there is a sweet spot when it comes to the best age to potty train your child. The right time is determined by the development of your child. The article indicates that training your child prior to the age of two, but after the age of three could lead to more daytime and nighttime accidents (more on this later). Potty training takes time. While the three-day solution is much faster than other methods, according to the article from Baby Center, success is determined more by how often the child is using the potty rather than diapers while still understanding that there may be accidents. An article from Daily Montessori indicates that the parents attitude plays a huge role in potty training. It's important to maintain a positive attitude and not put limitations on the process as this can be frustrating int he long run. Each child is different and learns at a different pace. 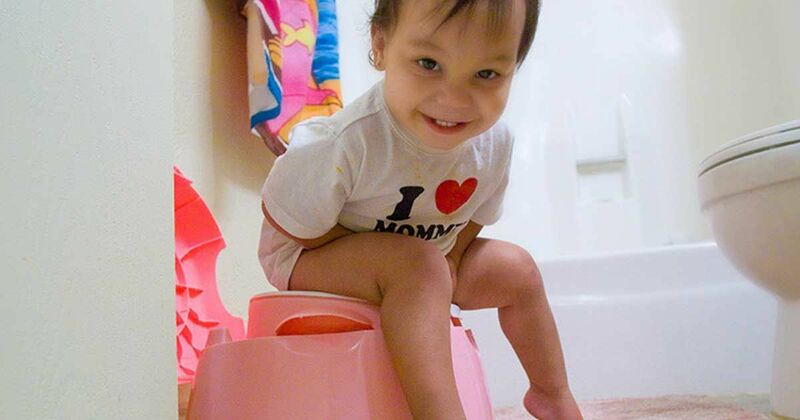 Before you begin potty training, there are some things you should do to prepare. For this particular method, you should set aside uninterrupted time so that you can focus completely on the process. Be sure to have your potty song ready to celebrate when your little one goes. Consider talking to your daycare about what you are doing with your child so they can also be on board. Don't forget the basics! Remember you need to introduce your child to the bathroom, potty, proper wiping, and hand-washing. Each step will take time to master. Even before you start potty training, the concept of sitting on a potty can be introduced through books, modeling and practice by sitting on the potty (even with diapers on), notes an article on Aha! Parenting. It's important that you let your child guide you through the potty training. According to the Cleveland Clinic rushing your child to potty training can actually have harmful side effects such as bladder issues from creating a smaller bladder to unnecessary stress for parents and children. According to What to Expect, there are a few signs you should look for. For example, if you are changing few diapers, it could mean that your child has better bladder control and are ready to start their training. Also, if your child is able to express their bodily functions or indicates that they are bothered by their soiled diapers could also be an indication. Children who understand bathroom words and if they follow you to the restroom to watch you could also be indications that they are ready to get things started. It is normal for your child to experience some accidents during the course of their potty training. Elizabeth Pantley, on Super Nanny, indicates that children who have been potty trained for six months may still have an accident once or twice per week. She indicates the best response is to make sure that you have the cleaning materials to deal with it and provide positive reminders for children. Responding negatively to accidents can make the experience stressful, potentially leading to greater resistance from your child. Consistency is key. However, Pantley also indicates that medical concerns should be ruled out if children experience regular accidents.